The main addition to this new release is Ripple, which is designed to enhance and compliment the current workflow process within People®. Ripple will allow you to customise and add flexibility to the current work process by filtering who the process will be looking at and whether you require a task or a process to initiate. 1. Create the alert details, title, who it is for, when itís due and the description. 2. Specify the segment (query) for who the alerts will be created for. Once a process has been defined you can specify which segment of employees it should start for. 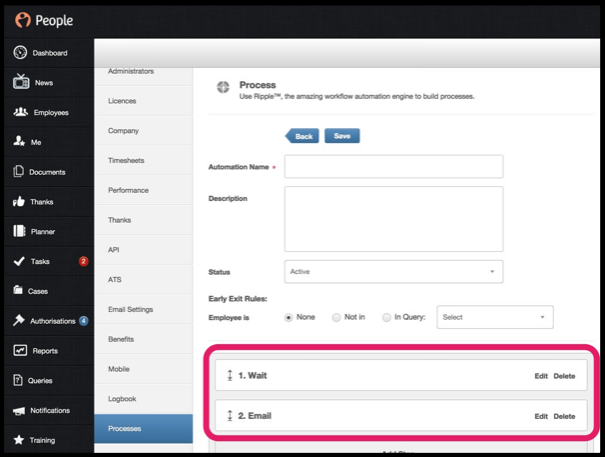 The Ripple Workflow Engine will then run every hour to refresh the query data it is looking at, and then create either a new alert or process for any employees that become active in the query. It will then also check the steps of an active process to see if it needs to perform the next step. An example of setting up a process could be that 1 day after an employees start date, a contract template is generated on their record and set to require a digital signature from them. Ripple can then wait 5 days, then check to see if it has been signed. If it hasnít been signed, an email can then be sent to the employee to prompt them. If it has been signed, the process can end and/ or notify admin if required. A new option that you will find within the employees Personal tab now allows you to set a continuous service date for the employee, along side the start date. Populating a continuous service date will now show length of service calculations based on this date. We now also have an option for your fixed term contract employees. Within the Employment tab, just under Notice Period, you can now add a fixed term end date. If the employees holiday entitlement is inclusive of public holidays, only public holidays up to the fixed term end date will be taken into account. The system will now allow you to see the remaining leave for any leavers in the system with historic tracking of that change. When you mark an employee as a leaver, the system will calculate their remaining entitlement based on the leaving date you specify. When you mark them as a leave immediately, you will then see this remaining leave shown in the employees planner. This will also be visible by the employee based on a future leave date, allowing them to use up any remaining pro rated holiday entitlements, if applicable. You can also see this change within the employees blue settings button in the planner, by clicking on the Clock icon. A new change to the Performance module now allows you to choose the Overall rating options you would like. 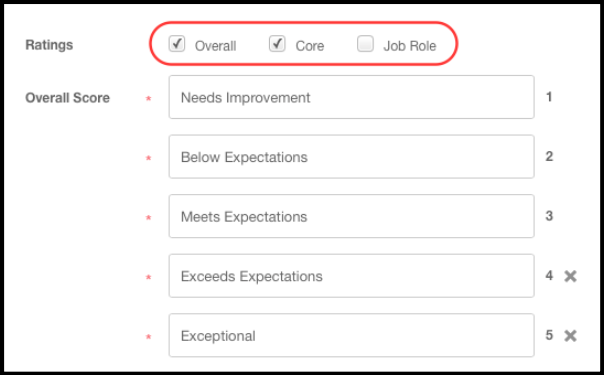 You can choose whether you would like no ratings or a combination of Overall, Core or Job Role Scores. This is very useful if you only wish employees to provide only a single overall score, or if you would prefer a score for each segment within the performance review which are in use. To make this change, simply access Settings then click on Performance. Then, either create a new review or click on a current review to open it up. If you then scroll down you will see the option for overall ratings. Within Company Settings, you will now see an option for employees to see their own salary. If you wish, you can turn this option off which will restrict employees from seeing their own salary within their Personal tab. 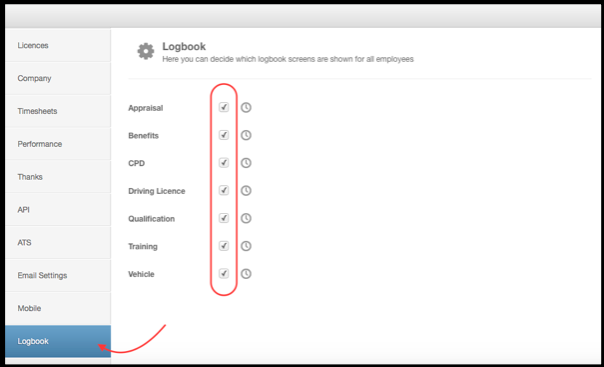 A new feature we have released is the option to turn off various logbook screens for your system. Within the logbook, you will see a number of pre-populated screens. Some of these screens may not be relevant or currently in use. You can now access Settings and then scroll down the list until you see Logbook. If you click into here, you can uncheck any of the screens, which you wish to be removed. They can then be activated again at any time if required. 1. Employees holiday entitlements can now be set through the API. 2. Changes have been made to the Document API, it is now possible to retrieve a list all Employee documents within the system including the details associated with them (access details etc).If required, you can also extract specific documents from the system using this API. 3. A new API call has been generated to allow you to set Leavers using the API. 4. When adding timesheets to the People system using the API, if a Project, Task or Detail is not already in the system, these will be added to the relevant dropdown list for Project, Tasks and Details. 5. If using the GetTimesheet API to pull employee timesheet information, this enhancement will now allow you to see any if/ when a change is made to a particular timesheet entry.